Restylane Vital is perfect for rejuvenating mature and sun damaged facial skin. It creates a glowing complexion by gently and naturally smoothing the skin from within, and gives a profound and long lasting effect. 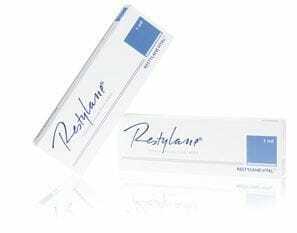 Restylane Vital is designed for injection into the face, hands and decolletage to restore moisture and subtle volume to sun-damaged and ageing skin. As well as, increasing hydration levels, there is also evidence it stimulates the production of collagen and elastin in the areas treated, helping to minimise the appearance of crepey skin. Vital has minimal downtime and is injected in a way that its is almost like a blanket effect to the skin, which has you looking smoothed and refreshed almost instantly. These usual methods of hydrating may only re-hydrate your skins surface for a short period of time and make them feel smoother, but the results are only going to be short-lived because creams lie on the surface of the skin and cannot penetrate to reach the deeper levels where hydration occurs. Sometimes the best beauty treatment is a simple injection that smooths out wrinkles and folds.